The main purpose of this post is to show you how to get the twitter2stata command working in Stata. Below are the steps you must take. To use this command, you must have a Twitter account. If you don’t have one, you can create one here. Twitter limits the amount of data you can download. For the best rate limits, you must create a Twitter app. To do this, login to the Twitter website, and go to https://apps.twitter.com. There are three fields you must fill in: Name, Description, and Website. The name of the application must be unique. 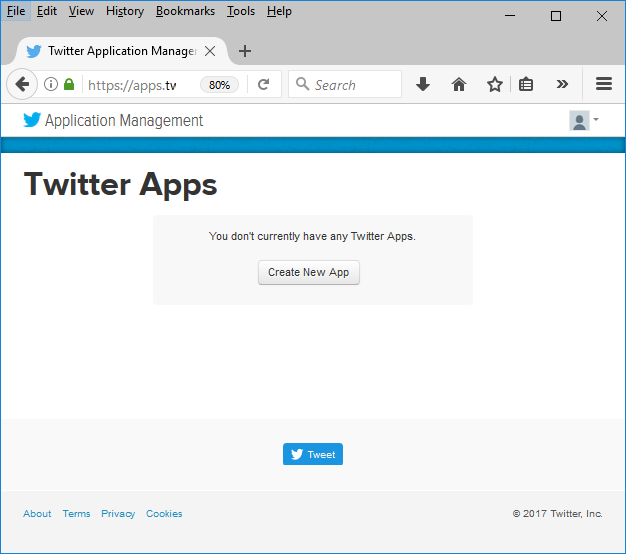 You might have to try a few times to find a unique Twitter application name. Once you have filled in the form, click on Create your Twitter Application. Next, click on the Key and Access Tokens tab. 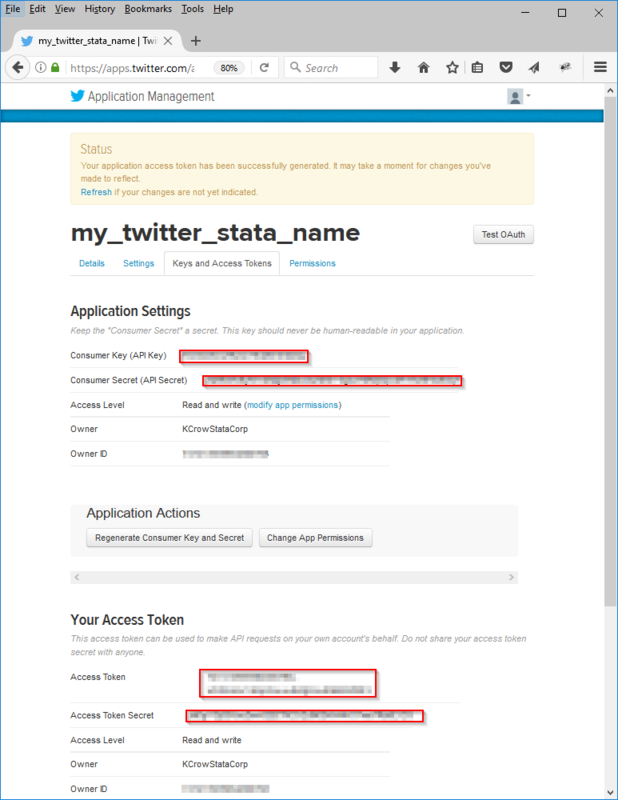 to initialize these settings for twitter2stata. If you don’t use twitter2stata setaccess … before each twitter2stata session, you will recieve the error below. access token and access token secret not set. 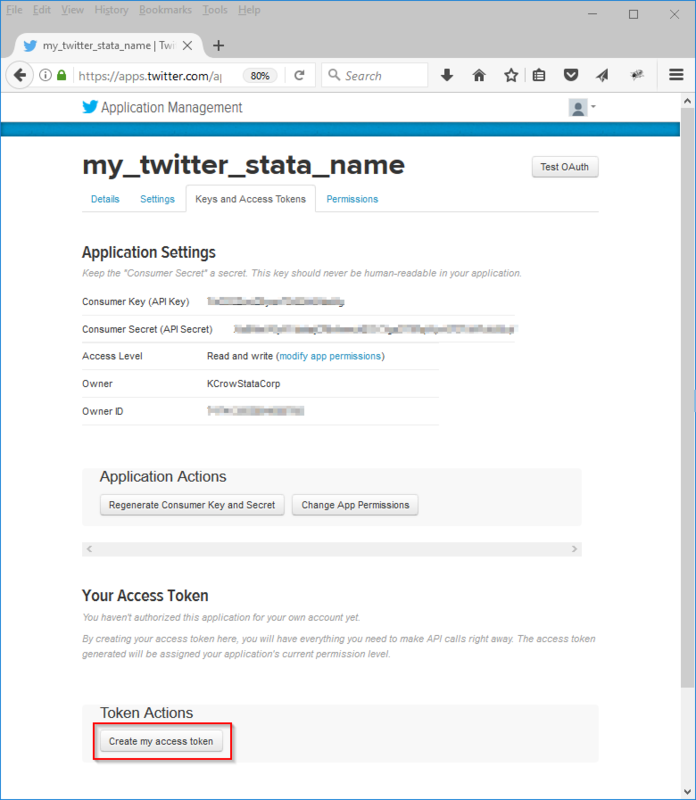 Run twitter2stata setaccess to set your access token and access token secret. Again, there are limits to the amount of data Twitter will let you import. These limits are subcommand specific and limit the number of calls you can make to Twitter’s REST API every 15 minutes. Click here, to see a chart of all the data rate limits. 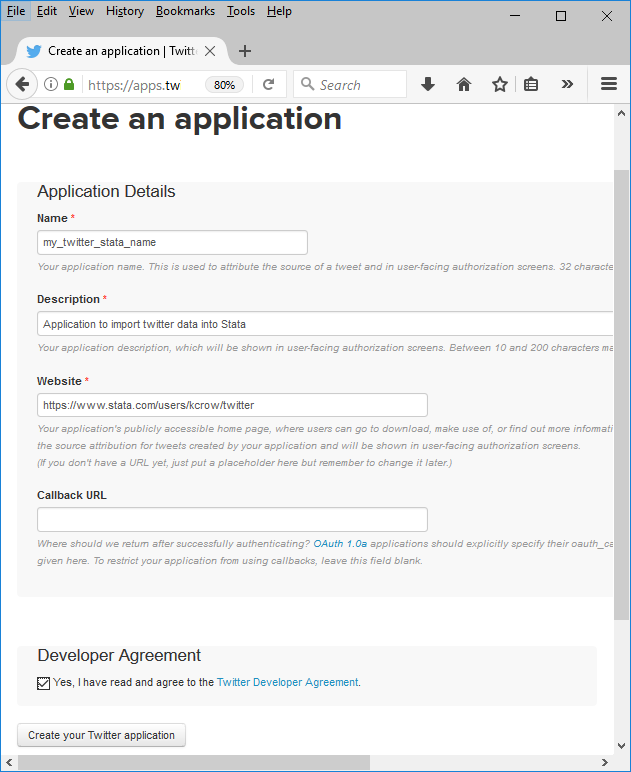 You can read the full details of twitter2stata‘s functionality in its help file after installing it. Dawson was able to write this command using Stata 15’s improved Java API together with Java library Twitter4J. In a later post, I will discuss how he went about developing this command and show you how easy it is to write Java code for Stata.